A funeral service for the late Mr. Peter Brian Stubbs, CPM, beloved husband of Kate, of Pembroke Parish, in his 84th year, will be held on 12th of February, 2019 at Christ Church, The Church of Scotland, Presbyterian, Middle Road, Warwick , at 4:00 pm [exactly!]. In lieu of flowers, donations in his memory may be made to Freemasons Fund For Bermuda at P. O. Box HM 2528 Hamilton HM CX or to Bank of Butterfield: A/c No: 2000 6060 719090 100. 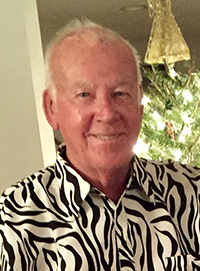 In addition to his wife, Peter is also survived by his children: Jackie [Steve] and Robert [Elisa]; his grandchildren Jackie, Savannah, Donovan, Shane and Adrianna; nieces and nephew Ali, William and Kate; he will also be lovingly remembered by his many other friends both here and abroad. Colours may be worn and are in fact encouraged.